I am worried. True, I feel a bit of anxiety about our pending appraisal, our precarious financial situation and how I haven’t started packing for our move yet, but what really has my heart palpitating is the thought of bringing Sacha to live in the brand new beautiful house dozens of people have been toiling away on since Oct. 1. 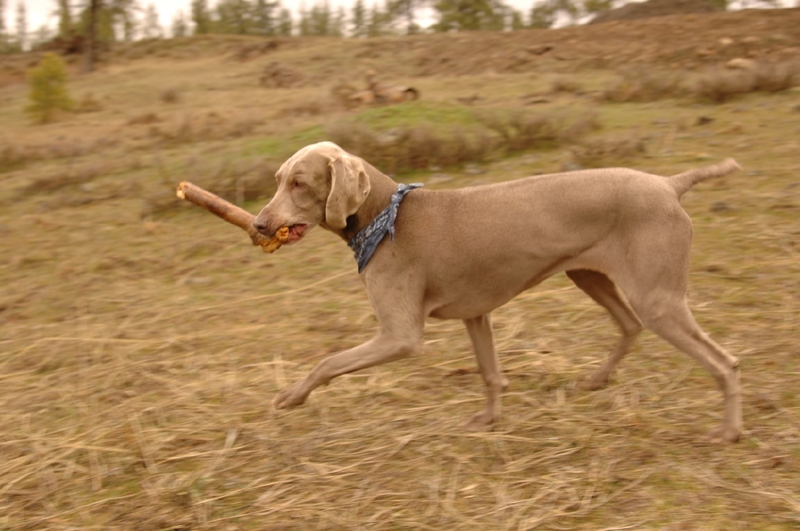 Sacha is a Weimaraner. She will turn 11 on August 29. That’s roughly 77 in dog years, but don’t let her senior status fool you into thinking any doddering grandma thoughts about her. 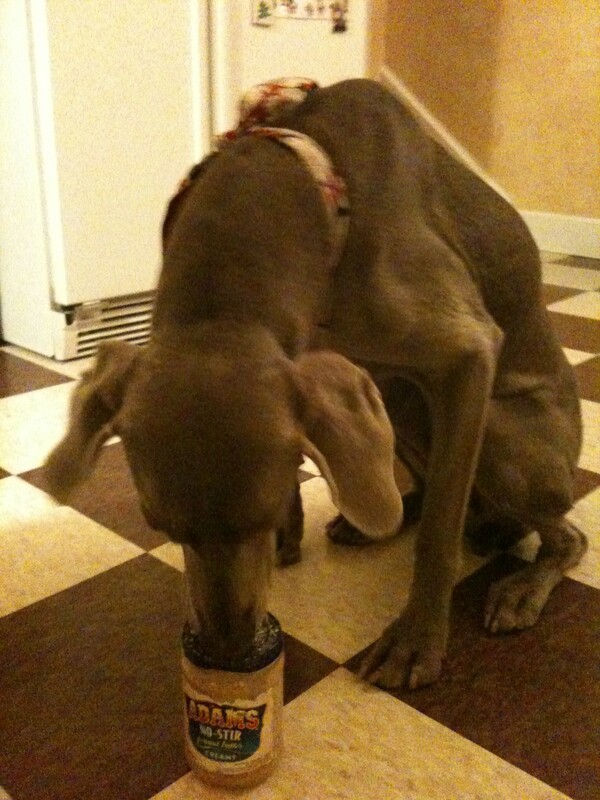 WMD also stands for “Weimaraners Make Disasters.” A continual refrain in our household is “Why must you ruin everything?” and also “Aarg! 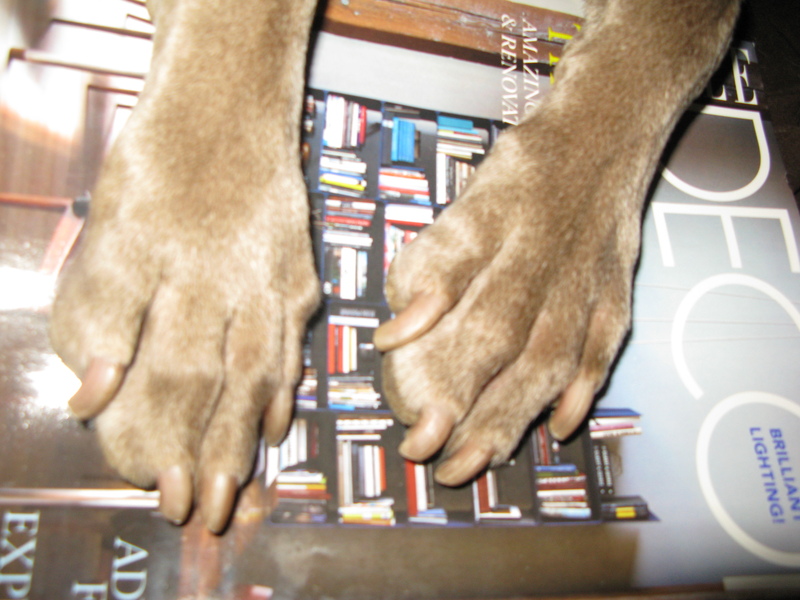 The counter terrorist has struck again!” as she nabs raw chicken or crackers or carrots off the kitchen counter. You’d never guess how many obedience classes she’s been to. Floors. Yes they are concrete, but with three coats of wax on them, they currently shine like a freshly Zambonied ice rink. Sacha comes equipped with 16 individual weapons of mass destruction in the form of razor-like talons at the ends of her limbs. Good-bye, glistening floors. Hello, dull, scratched surface! Sigh. Doors. 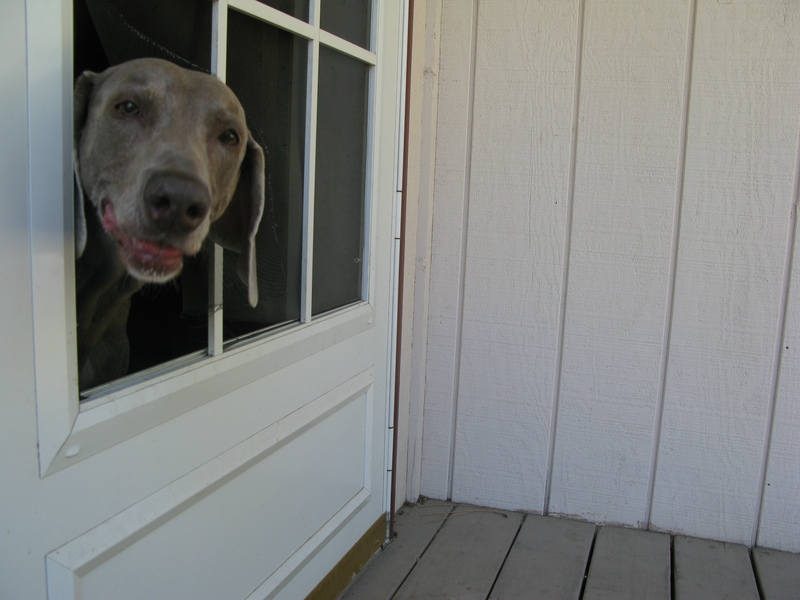 When Sacha wants to go outside, she will often paw at the door she wants magically to open. Our new front door is made of mahogany that I lovingly and carefully sanded and coated with FIVE (5) coats of spar varnish over a period of several days. I am considering adding an extra five coats to the part of the door Sacha is most likely to swipe at with her razor fingers, just to try to stay ahead of the inevitable. The other doors in the house are made of lovely vertical-grain fir. Sigh. Screens. We have a nice big slider off the living room that will eventually open onto a patio area. The fine people at Sierra Pacific, who created all our stunning windows, will come soon to install all the special screens on the windows and the slider. How nice it will be to enjoy a gentle breeze through the wide screen door … until a chipmunk/turkey/neighbor dog/moose/bird/porcupine/insert-any-of-many-other-indigenous-meadow-species-here ambles by and Sacha runs right through the screen door. Sigh. Maybe Sacha will be getting a pair of slippers and blinders for her birthday. Notice the sleek sporting dog. What a stunning specimen. Now look closer. See the big dark stain on her neck. That's turkey poop. And what's that in her mouth? A half of a deer leg. Oooh. Look at the sweet doggie. What's she doing? This took work. I'm still surprised we didn't end up at the veterinary surgeon's office, paying another four figure bill. 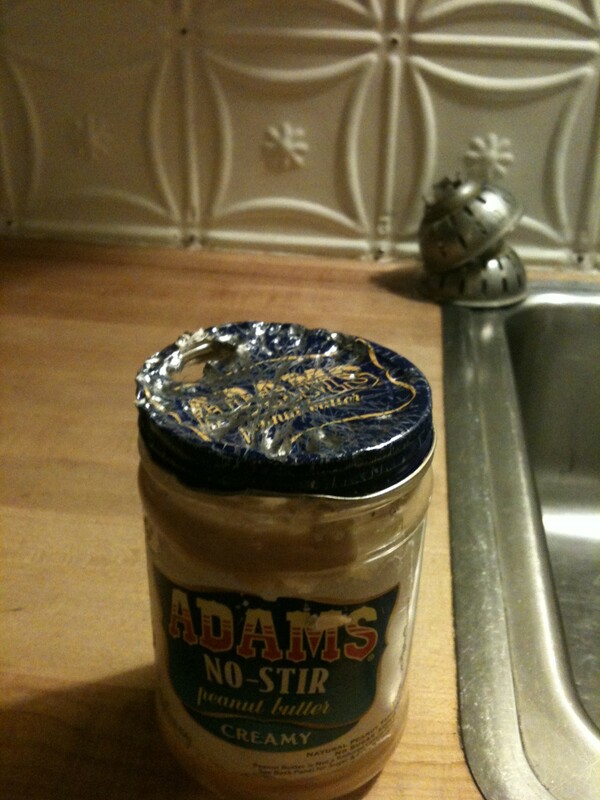 Well, of course… It’s the good peanut butter… it’s hard to fault a dog with discerning taste and a good dental plan…. Don’t be a fall box. lswartz79@hotmail.com spokane. be a cheese and explore beyond the antiquated address. beers? cheers.